Challenging private use and consumption of objects has been central to what I’ve been doing recently. Well, this and my secret goal in life, which I think is to make everything in the world more like Lego. So, I reasoned, it was time to accept the inevitable and do some IKEA hacking. 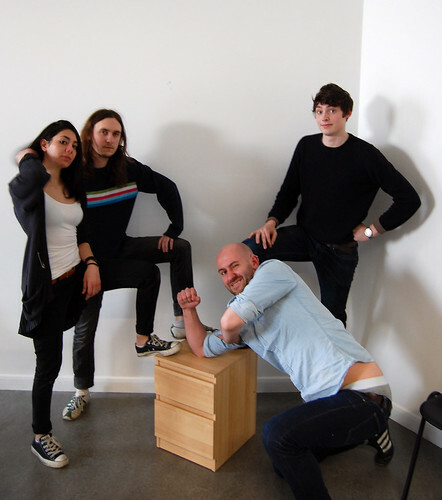 I took an IKEA kit, in this case a “Kullen” chest of drawers, and set about how I might fragment or rearrange it to make sociability, sharing and co-operation intrinsic to its existence. I went through the instructions, splitting them into four separate books, each only containing a quarter of the guidelines to making the cabinet. Then I repackaged the components into four boxes, the contents each corresponding to their respective fragmented instruction manuals. 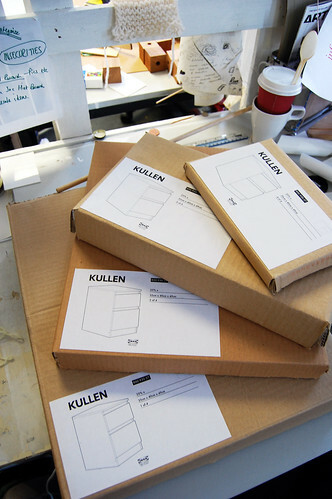 And there you have it – one 2-drawer KULLEN cabinet. Look at them, aren’t they proud? I think you could call it a success. I love how they hit nails in for each other at the end – it was a change in behaviour that was not in any way dictated by the instructions, but arised as a result of the way the task was designed. Which is good. 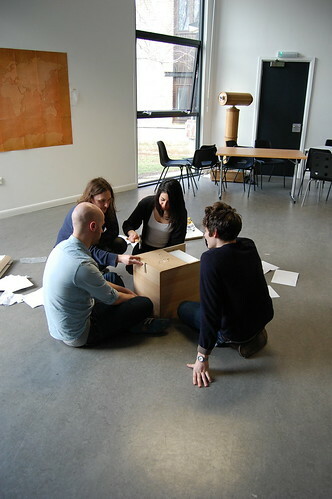 The way the instructions were used surprised me too – much less based on a sequence and taking turns, but in a more fluid and collaborative way, bringing them all together in the middle and discussing how each stage links with another. Matt, who had the least pieces in his box and therefore the least “to do”, took the role of making the other people’s instructions make sense together. Its interesting to see how different people react to these situations. There’s no doubt, once again, that doing this alone would be quicker – it took the guys about 40-45 minutes to finish the thing. But all this has nothing to do with efficiency. I’ll write more on this another time. 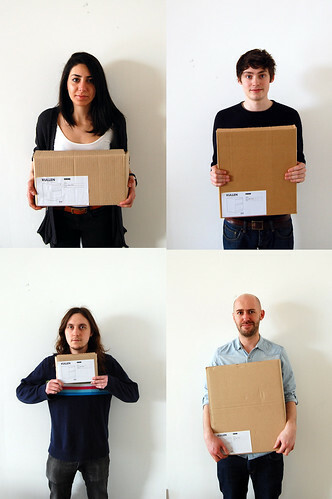 Thanks to Ben, Matt, Mikey and Zahra for so wonderfully displaying their IKEA prowess. This entry was posted in Filmings, Makings and tagged co-operation, Design, Ikea, ikea hacking, kullen, making. Bookmark the permalink. Not at all like the ikea build but interesting. Maybe?